The development of clinical content for CareConnect, UCLA’s electronic health record program, is currently underway, and physician involvement from all specialties is crucial in the process. A physician content design meeting, led by CareConnect Clinical Content Coordinator Carlos Lerner, MD, was held Sept. 8 to discuss content for the neonatal intensive care unit. The group of physicians reviewed one of the first 20 order sets that will need to be designed before testing begins. 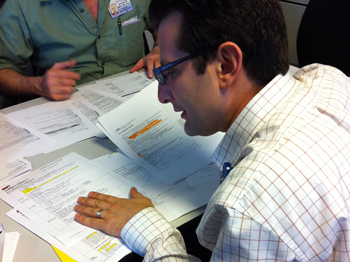 Dr. Lerner is one of eight clinical content coordinators facilitating the development of content. Click here to see the list of clinical content coordinators. in CareConnect. 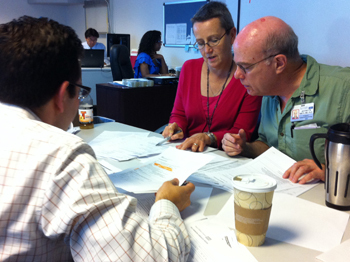 Jeffrey Smith, MD, (back) makes a point while Marianne S.
Anderson, MD, (front) looks over the order sets.